Creating new ways to delight and entertain his audiences is at the heart of Mark's mission. His invention of the Laser Diablo merges juggling, light and technology. Imagine four Lasers being juggled at thousands of rpms, with the spinning laser beams dancing just above the audience's heads. He is constantly working on new ideas. Are you ready to take your audience to the next level? 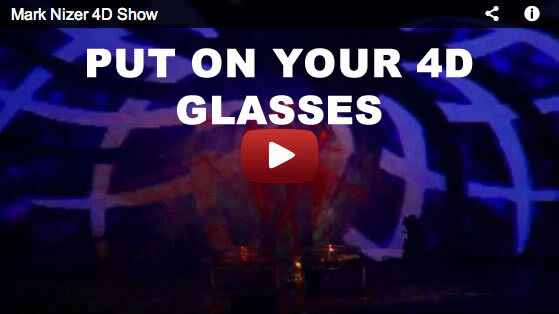 Mark's 4D show includes music, Robots, and lasers. After one look, you'll see why Performance Magazine called his show "nothing less than brilliant". Mark Nizer can custom tailor his performance to work in your products and message. His writing has helped corporations around the world roll out new products, celebrate a successful year or get the message out. His unique juggling talent lets him include your products in his presentation. There is no limit to what is possible. From Harley Davidson Motorcycle parts to Bethlehem Steel's steel girders to toilet paper, Mark has juggled it all. A winning combination is to combine an afternoon interactive workshop with a evening performance to reinforce and demonstrate the concepts from the day as well as entertain. Mark Nizer has taken his unique performance and workshops to thousands of venues around the world. Whether it's a roll out of a new Harley Davidson product or keeping a small group of Fortune 100 executives enthralled for an hour, Mark can grab your group's attention and never let it go. The 4D version requires special glasses. The show work's great either way, but the 4D option is totally unique. You can even have your company logo printed on the glasses. Mark has partnered with Siri Nizer (of iPhone fame) who is his virtual assistant. With Siri in the cast we can run the entire show without additional crew. Mark can bring all lights, sound and video equipment with him, or, plug into your lights, sound system and projector. This allows the show to have thousands of light cues, show automation and effects that would never be possible before. 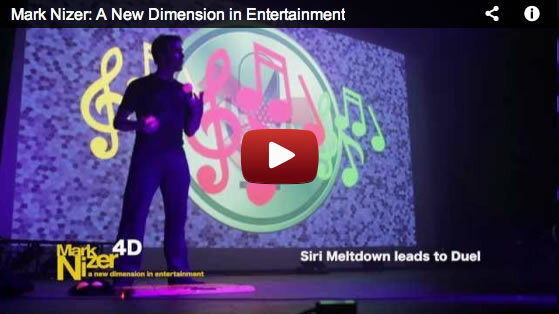 Mark Nizer - A New Dimension in Entertainment, truly is the FIRST one man show. This interactive workshop combines a multimedia presentation and lecture with a hands on workshop to teach the principles of productive multi-tasking. In today's busy competitive business world, where we focus our attention at what time can make the difference between success and failure. This event is designed to give a new perspective on a problem and how to come up with new solutions not thought of before. How to look at a problem from a different point of view. Explore new solutions with a whack on the side of the head. A stage with a 12' x 24' ceiling or higher. Blackout capability is nice for the lazers and other special effects but not required. Mark can bring everything including lights, sound and video if needed. A light colored wall, movie screen or cyc behind the stage is helpful to project video to. In a typical set up, Mark plugs into your lights and sound system with his laptop and runs everything remotely from stage. We send the simple light plot ahead of time and focus lights and sound check prior to the show. Complete Tech information is available here. This is a big show, how much is freight? ZERO. The entire show is capable of fitting in three cases that can be checked as luggage on a commercial plane. If Mark is driving he may bring additional equipment.